'Tis the season of college rankings (Princeton Review here and Forbes here) and moments ago, US News & World Report released its numbers. Unfortunately - if you care about this sort of thing - Vassar has slipped one spot in the rankings to #12 after holding the #11 spot for the past three years. We share the twelfth spot with Wesleyan. Vassar also received a score of 86 out of 100. 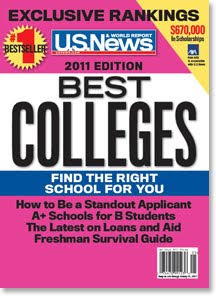 US News & World Report has separate lists for national universities and national liberal arts colleges. Harvard (#1), Princeton (#2), and Yale (#3) topped the universities list, while Williams (#1), Amherst (#2), and Swarthmore (#3) took the top spots for liberal arts colleges. In other categories, Vassar ranked #11 for Best Values for Liberal Arts Colleges with 55.5% of students receiving an average discount of 61% from the total cost. We're also at #6 for High School Counselor Rankings for Liberal Arts Colleges, tied with Amherst, Wesleyan and others. As for the methodology, the rankings are based on factors like academic reputation, graduation and freshman retention, faculty resources, student selectivity, financial resources, and alumni giving rate.